In simplest terms, vibration in motorized equipment is merely the back and forth movement or oscillation of machines and components, such as drive motors, driven devices (pumps, compressors and so on) and the bearings, shafts, gears, belts and other elements that make up mechanical systems. Vibration in industrial equipment can be both a sign and a source of trouble. Other times, vibration just “goes with the territory” as a normal part of machine operation, and should not cause undue concern. But how can the plant maintenance professional tell the difference between acceptable, normal vibration, and the kind of vibration that requires immediate attention to service or replace troubled equipment? 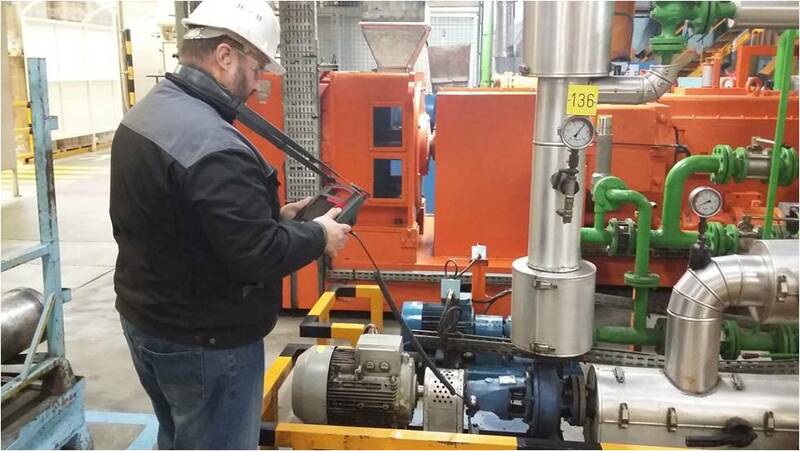 With a basic understanding of vibration and its causes—and equipped with the new and unique vShooter Vibration Analyser Camera VBS1T – the maintenance professional can quickly and reliably determine the cause and severity of most machine vibration and receive recommendations for repair. It’s all done with the intelligence built into the vShooter, without the extensive monitoring and recording required for typical, long-term vibration monitoring programs. Vibration is not always a problem. In some tasks, vibration is essential. Machines such as oscillating sanders and vibratory tumblers use vibration to remove materials and finish surfaces. Vibratory feeders use vibration to move materials. In construction, vibrators are used to help concrete settle into forms and compact fill materials. Vibratory rollers help compress asphalt used in highway paving. In other cases vibration is inherent in machine design. For instance, some vibration is almost unavoidable in the operation of reciprocating pumps and compressors, internal combustion engines and gear drives. In a well engineered, well maintained machine, such vibration should be no cause for concern. Most industrial devices are engineered to operate smoothly and AVOID vibration, not produce it. In these machines, vibration can indicate Vibration technology problems or deterioration in the equipment. If the underlying causes are not corrected, the unwanted vibration itself can cause additional damage. In this Application Note we are focused not on machines that are “supposed” to vibrate as part of normal operation, but on those that should not vibrate: electric motors, rotary pumps and compressors, and fans and blowers. In these devices smoother operation is generally better, and a machine running with zero vibration is the ideal. Vibration can result from a number of conditions, acting alone or in combination. Keep in mind that vibration problems may be caused by auxiliary equipment, not just the primary equipment. These are some of the major causes of vibration. Imbalance – A “heavy spot” in a rotating component will cause vibration when the unbalanced weight rotates around the machine’s axis, creating a centrifugal force. Imbalance could be caused by manufacturing defects (machining errors, casting flaws) or maintenance issues (deformed or dirty fan blades, missing balance weights). As machine speed increases the effects of imbalance become greater. Imbalance can severely reduce bearing life as well as cause undue machine vibration. Misalignment/shaft runout – Vibration can result when machine shafts are out of line. Angular misalignment occurs when the axes of (for example) a motor and pump are not parallel. When the axes are parallel but not exactly aligned, the condition is known as parallel misalignment. Misalignment may be caused during assembly or develop over time, due to thermal expansion, components shifting or improper reassembly after maintenance. The resulting vibration may be radial or axial (in line with the axis of the machine) or both. Wear – As components such as ball or roller bearings, drive belts or gears become worn, they may cause vibration. When a roller bearing race becomes pitted, for instance, the bearing rollers will cause a vibration each time they travel over the damaged area. A gear tooth that is heavily chipped or worn, or a drive belt that is breaking down, can also produce vibration. Looseness – Vibration that might otherwise go unnoticed may become obvious and destructive if the component that is vibrating has loose bearings or is loosely attached to its mounts. Such looseness may or may not be caused by the underlying vibration. Whatever its cause, looseness can allow any vibration present to cause damage, such as further bearing wear, wear and fatigue in equipment mounts and other components. The effects of vibration can be severe. Unchecked machine vibration can accelerate rates of wear (i.e. reduce bearing life) and damage equipment. Vibrating machinery can create noise, cause safety problems and lead to degradation in plant working conditions. Vibration can cause machinery to consume excessive power and may damage product quality. In the worst cases, vibration can damage equipment so severely as to knock it out of service and halt plant production. Yet there is a positive aspect to machine vibration. Measured and analyzed correctly, vibration can be used in a preventive maintenance program as an indicator of machine condition, and help guide the plant maintenance professional to take remedial action before disaster strikes. To understand how vibration manifests itself, consider a simple rotating machine like an electric motor. The motor and shaft rotate around the axis of the shaft, which is supported by a bearing at each end. One key consideration in analyzing vibration is the direction of the vibrating force. In an electric motor, vibration can occur as a force applied in a radial direction (outward from the shaft) or in an axial direction (parallel to the shaft). An imbalance in the motor, for instance, would most likely cause a radial vibration as the “heavy spot” in the motor rotates, creating a centrifugal force that tugs the motor outward as the shaft rotates through 360 degrees. A shaft misalignment could cause vibration in an axial direction (back and forth along the shaft axis), due to misalignment in a shaft coupling device. Another key factor in vibration is amplitude, or how much force or severity the vibration has. The farther out of balance a motor is, the greater its amplitude of vibration. Other factors, such as speed of rotation, can also affect vibration amplitude. As rotation rate goes up, the imbalance force increases significantly. Frequency refers to the oscillation rate of vibration, or how rapidly the machine tends to move back and forth under the force of the condition or conditions causing the vibration. Frequency is commonly expressed in cycles per minute or Hertz (CPM or Hz). One Hz equals one cycle per second or 60 cycles per minute. Though we called our example motor ‘simple,’ even this machine can exhibit a complex vibration signature. As it operates it could be vibrating in multiple directions (radially and axially), with several rates of amplitude and frequency. Imbalance vibration, axial vibration, vibration from deteriorating roller bearings and more all could combine to create a complex vibration spectrum. Understanding why vibration occurs and how it manifests itself is a key first step toward preventing vibration from causing trouble in the production environment. The new vShooter Vibration Analyser Camera takes it from there. 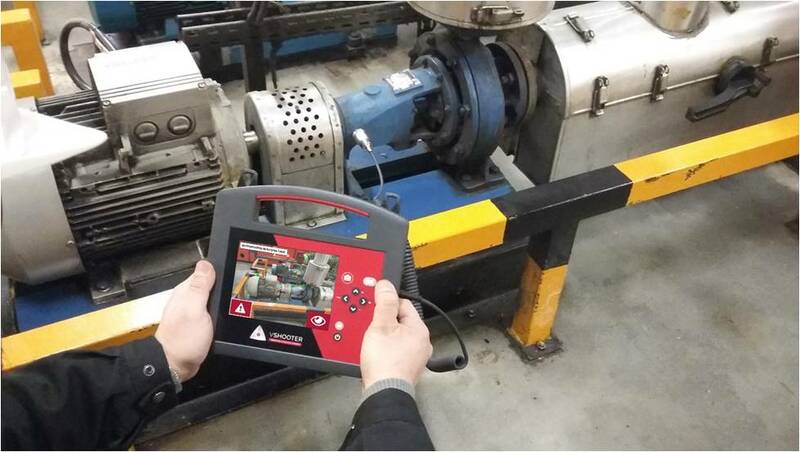 This advanced hand-held device is designed and programmed to diagnose the most common mechanical problems of unbalance, looseness, misalignment and bearing failures in a wide variety of mechanical equipment, including motors, fans, blowers, belts and chain drives, gearboxes, couplings, pumps, compressors, closed coupled machines and spindles. 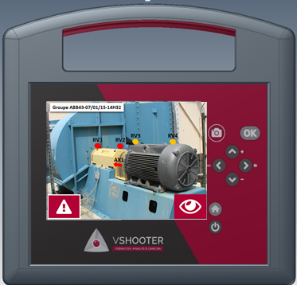 The vShooter Vibration Analyser Cameraquickly detects vibration along three planes of movement, then provides a plain-text diagnosis with a recommended solution. 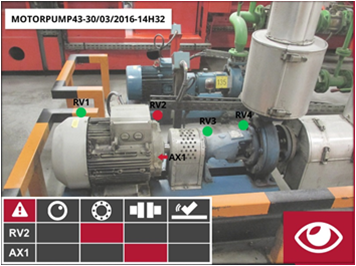 The diagnostic technology in the vShooter Vibration Analyser Camera, using MCP (machine Condition Pictures) quickly analyzes machine operation and identifies faults by comparing vibration data to an extensive set of rules developed over years of field experience. Typical vibration analyzers and software are intended for monitoring machine condition over the longer term, but they require special training and investment that may not be possible in many companies. 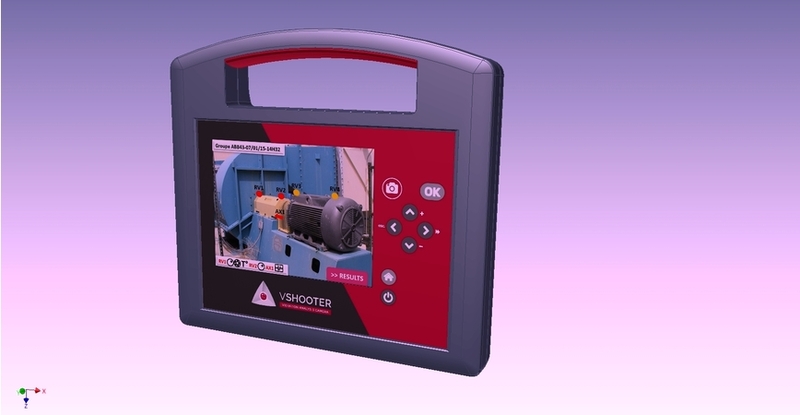 The vShooter Vibration Analyser Camera is designed specifically for maintenance professionals who need to troubleshoot mechanical problems and quickly understand the root cause of equipment condition.